Stock # 145824, 6.7L I6 Cummins Turbo Diesel Engine, Manual, 49184 mi. 2016 RAM 3500 DRW RWD Tradesman 2DR Regular Cab Dually 6.7L Cummins turbo diesel engine with Manual 6 speed transmission. 1 Texas owner truck, Custom CM Flat Bed, brand new tires, 17" steel wheels with chrome simulators, gooseneck hitch, keyless entry, power door locks, power windows, power tow mirrors, chrome front bumper, Ice cold AC, and much much more. This is very very nice truck with only 49K miles. It's as good as it looks. Plus this truck is Carfax certified, and qualifies for the Carfax buy back guarantee. This is an outstanding vehicle! Buy with confidence and save thousands! As every one of our trucks this one went through our service department and completed our full inspection and service. All the fluids and filters are new and truck is ready to go! Please Call us with any questions. 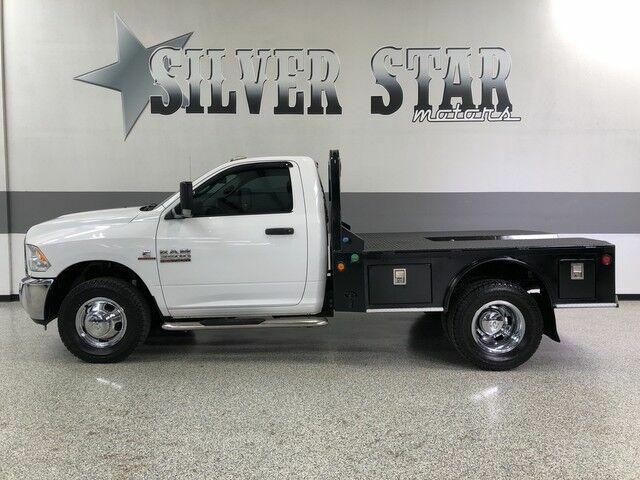 We have financing available, please go to www.texassilverstarmotors.com and click on the financing link, not all vehicles will qualify, depending on year and miles. Ask us about extended warranties, we have very competitive pricing and great coverage options. We can assist you with reliable shipping to your home or complementary Airport Pick Up at DFW International Airport or Dallas Love Field! Please contact us with any questions. Trey @ 972-637-4234, Rick @ 972-935-5788, William @ 214-674-9221, Blanca @ 972-351-2840, Para Espaol contactar Blanca @ 972-351-2840.